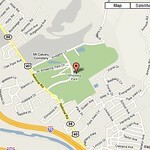 Wheeling Park is a 406-acre activity center, rich in history, with a variety of attractions. With both indoor and outdoor recreational activities available, Wheeling Park has become a well-known, year round destination that attracts 500,000 visitors annually. Opening on May 30, 1925, Wheeling Park has matured gracefully. Some of the park's older points of interest still remain: the White Palace (1926), the handsome Sonneborn gates, the impressive "Madonna of the Trail" statue (erected by the Daughters of the American Revolution in 1928), the charming Frank Rock Garden (created in 1929), the Schwertfeger Shelter (1948) and the Stifel Playground (1948) and the golf course (opening 1926). Construction of the Memorial Ice Rink changed Wheeling Park into a year-round facility when it opened in 1959. The W.E. Stone Memorial Clubhouse and Pool opened in 1968, with a water slide added in 1979. In 1972, a boathouse, dock and miniature golf course was added to the Good Lake, and in the same year, a tennis air dome was erected. The hilltop area at Wheeling Park started its development with Sonneborn Shelter, completed in 1973. Six tennis courts and the Boyce Tennis Shelter were added to the hilltop in 1984, and the soccer field complex was added in the late 1980s. Improvements and additions continue as Wheeling Park moves into the 21st century. From soccer, golf and hockey tournaments to summer day camp, from holiday parties to company picnics, Wheeling Park remains a beloved facility by all who visit.